The study population is randomized to treatment strategies as opposed to treatments per se. More precisely, patients are randomized to either a biomarker-based treatment strategy arm where the biomarker is used in deciding on approach to treatment, or to an arm that does not use the biomarker to guide treatment. Biomarker-strategy designs make a comparison between two strategies—one which uses biomarker information to inform treatment approach and the other that does not. They are also known as biomarker-based strategy designs or signature-based strategy designs. This approach is preferred when the study is planned for a confirmatory phase of a certain biomarker-based strategy allowing for comparison between the biomarker-based strategy and non-biomarker-based strategy. View more details by clicking on image to fully expand. Then hover over boxes for info. This approach was proposed in the field of pharmacogenetics involving the assessment of pharmacogenetic diagnostics being performed during the study. In this sequential approach each patient serves as his/her own control. This individual crossover approach requires a smaller number of patients as compared to the previous designs described and is not considered complex in its implementation. Before–after comparisons are the basis of medical practice in many important therapeutic areas such as surgery and they can inform researchers about whether a personalized treatment is more effective than the standard of care. 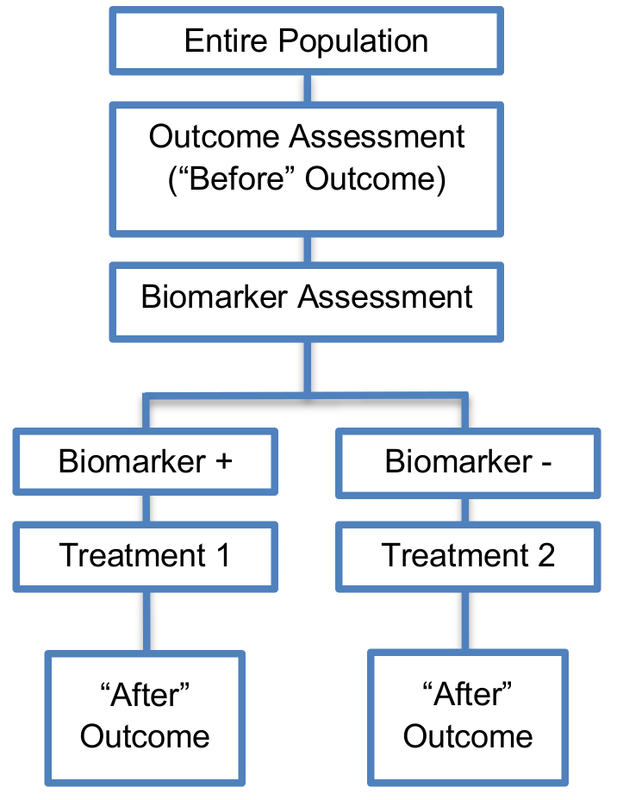 This is an approach proposed for the validation of prognostic biomarkers which randomly assign the study population between classifiers (i.e., a new biomarker and a standard biomarker) rather than treatments validating directly the new biomarker. An example of an actual trial which uses this approach is the MINDACT trial [Google Scholar]. More precisely, in the MINDACT trial the entire population is evaluated by two analyses, the 70-gene profile (biomarker-based analysis) as well as clinicopathologic factors (non-biomarker-based analysis). Next, only patients with discordant results (i.e., patients predicted to be high risk based on one of the two analyses and low risk patients based on the other analysis) will be randomized to either the biomarker-based strategy or to the non-biomarker-based strategy). Next, as exactly in the biomarker-strategy designs with biomarker assessment in the control arm, patients who are randomly assigned to the biomarker-based strategy arm are treated either with the experimental treatment if they have biomarker-positive status or with the control treatment if they have biomarker-negative status. The main limitation of biomarker-strategy designs is that they can result in a significant number of patients in the trial who are assigned to the same treatment in both biomarker-based strategy arm and non-biomarker-based strategy arm (i.e., biomarker-negative patients in the biomarker-based strategy arm receive control treatment but, biomarker-negative patients might also receive control treatment in the non-biomarker-based strategy arm as the random assignment of the entire population to this strategy arm is independent of their biomarker-status). Consequently, a large sample size is needed to identify the diluted treatment effect. 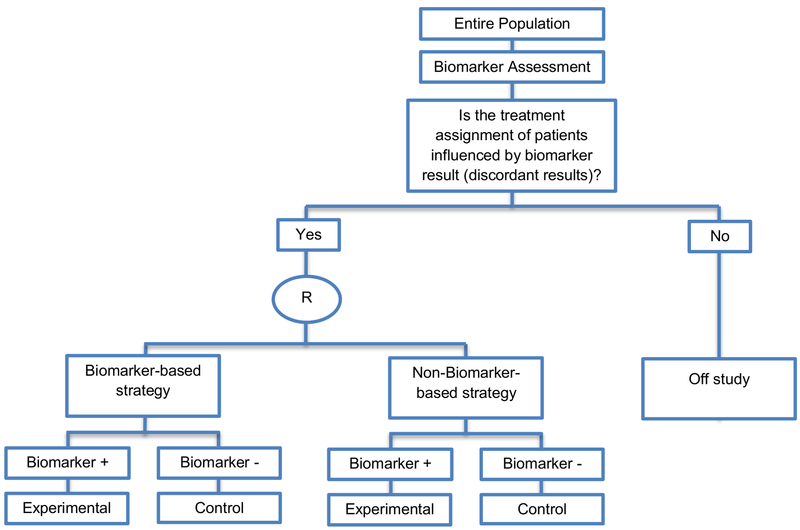 This modified version promises to solve this limitation of biomarker-strategy designs by only randomizing patients for whom treatment assignment is influenced by biomarker result.